Louise is a major source of musical inspiration in Australia. 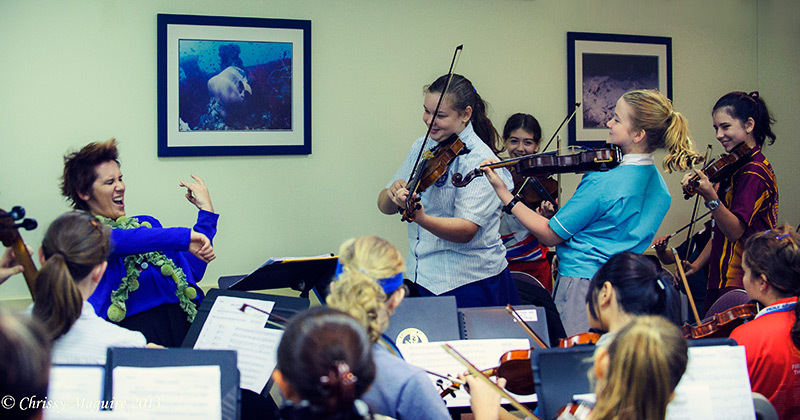 She provides the richest musical experience for her students, from the enthusiastic beginner to the aspiring professional, creating opportunities to perform and to take part in ensembles and masterclasses. Interested in coming to a workshop? Louise King regularly runs workshops. The following are all available to hone your skills and experience the joy of learning with an inspired teacher. To engage Louise to run a workshop please contact her to discuss your idea and requirements. Creative Strings Workshop – Discover in a fun and hands on interactive workshop how to use your imagination and instrument to create unusual sounds and technical effects inspired by nature and it’s many soundscapes. Listen to short excerpts of unusual Australian music on CD and live examples of ‘extended contemporary string techniques’. Learn how to play ancient birdcalls, didgeridoo bowing and work in ‘improvisation sound teams’ to create a short musical composition based on nature. Learn how texture, timbre, tone, volume and pitch can all be inspired and crafted by natural objects and natural sounds. See examples of modern compositions using these techniques and discover graphic scores. Create a simple team graphic score to keep as a record of your own improvisation and perform and share your creative works in front of the workshop participants.